“Fungal Infected” is an acquired template that can be added to any living creature (other than plants) susceptible to diseases, referred to hereafter as the base creature. Type: The creature's type changes to plant. It retains any subtype except for alignment subtypes (such as good) and subtypes that indicate kind. It does not gain the augmented subtype. It uses all the base creature's statistics and special abilities except as noted here. Senses: Fungal infected gain low-light vision and use a primitive form of echo-location to aid in navigating their environment, gaining blindsense 10 feet. When using their blindsense ability, a fungal infected makes clicking noises equivalent to the volume of human speech for purposes of detection by Perception checks. Due to fungal growth in the eyes a fungal infected suffers a -4 penalty on vision-based Perception checks. Hit Dice: Drop HD gained from class levels (minimum of 1) and change racial HD to d8s. Fungal infected gain a number of additional HD as noted on the following table. Saves: Base save bonuses are Fort +1/2 HD +2, Ref +1/3 HD, and Will +1/3 HD. Defensive Abilities: Fungal infected lose their defensive abilities and gain all of the qualities and immunities granted by the plant type. Weakness: Fungal infected take half again as much damage (+50%) from fire. Speed: Winged fungal infected can still fly, but maneuverability drops to clumsy. If the base creature flew magically, so can the fungal infected . Retain all other movement types. Attacks: A fungal infected loses all the manufactured weapon attacks and weapon proficiencies of the base creature, but retails all natural attacks. It also gains a bite attack (if it did not already possess one) that deals damage based on the fungal infected's size, but as if it were one size category larger than its actual size (see Natural Attacks). A fungal infected's bite attack is diseased and creatures damaged by it are exposed to cordyceps infection. Special Attacks: A fungal infected retains none of the base creature's special attacks. Abilities: Str +2, Dex +2, Con +2. A fungal infected's Intelligence and Charisma drop to 1. BAB: A fungal infected's base attack is equal to 3/4 its Hit Dice. Skills: 2 + Int modifier (minimum 1) per Hit Die. Perception and Stealth are class skills for a fungal infected. Feats: A fungal infected loses all feats possessed by the base creature, gains feats based on its new total HD. Special Qualities: A fungal infected loses most special qualities of the base creature. It retains any extraordinary special qualities that improve its melee attacks. A fungal infected gains the following special qualities. When a fungal infected dies, it explodes in a burst of spores. All creatures adjacent to the fungal infected are exposed to the spores as if struck by a bite attack and must make a Fortitude save or contract cordyceps infection. The bite attack of a fungal infected carries the cordyceps infection disease. A fungal infected reduced to 0 or fewer hit points, but not slain, falls dormant and no longer can naturally recover hit points. At this stage, the infected's body shuts down and is consumed by its fungal infestation, becoming a spore husk hazard (see below). A fungal infected's spore colony completes this transformation in 24 hours, growing into a spore husk that fills one 5-foot square per HD of the fungal infected. Exposure to 3 hours of direct sunlight or 5 points of fire damage is sufficient to destroy the spore colony and prevent transformation into a spore husk. Spore husks in environments of severe cold will not form and are inert, remaining so until exposed to warmer temperatures for 24 hours. A plant growth spell doubles the area of the spore husk, and a diminish plants spell halves it. A blight spell destroys the spores and prevents the husk's creation. Fungal infected that survive for long periods of time undergo transformation through the invasive fungus' life cycle and the eventual death of the host body. It takes a cumulative 1 year per HD of the fungal infected to evolve to each successive stage of development. A plant growth spell halves the transformation time, and a diminish plants spell doubles it. 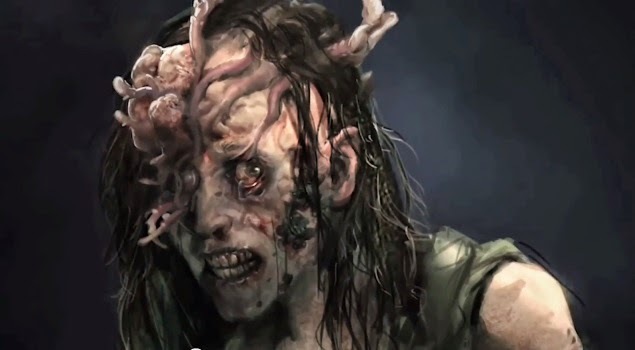 A blight spell destroys the fungal spores and prevents the corpse's transformation. The cordyceps growths on a fungal stalker are more pronounced, with one or both eyes now entirely consumed by the fungus. To make up for their loss of eyesight, fungal stalkers develop a throaty croaking sound; the nascent form of echolocation. Their movements are slower and stiffer, but their strength has dramatically increased due to corded fungal colonies intertwining with muscle fibers. HD: A fungal stalker gains 3 additional HD. Senses: A fungal stalker is blind. Fungal stalkers blindsense increases to 20 feet and it gains blindsight within 5 feet. Attacks: A fungal stalker gains 2 slam attacks that deal damage based on the fungal stalker's size. Speed: A fungal stalker's speed decreases by 10 (minimum 5 feet). Natural Armor: A fungal stalker's natural armor bonus increases by +5. Notable for the blooming fungal plate erupting from their face, clickers are a ravenous and nearly unstoppable evolution of the fungal infected. Relying solely on refined echolocation to detect prey, clickers are just as stiff in their movements as stalkers, though their strength is significantly greater. HD: A fungal clicker gains 6 additional HD. Senses: A fungal clicker's blindsense increases to 40 feet and its blindsight increases to 10 feet. Natural Armor: A fungal stalker's natural armor bonuses increases by +3. The final known evolution of a fungal infected is known as a bloater. By this stage of the evolution the bloater has doubled in size from massive fungal growths both inside and outside of their bodies. Plates of chitin-like fungal plates serve as a form of hardened armor, and bulging pustules of corrosive secretions laden with infectious spores blossom on their armored carapaces between plates. Size: A fungal bloater increases its size by one category. HD: A fungal bloater gains 4 HD. Defensive Abilities: A fungal bloater gains DR 10/piercing. Attacks: A fungal bloater's slam attacks deal damage as if it were one size category larger than its adjusted size. Natural Armor: A fungal bloater's natural armor increases by +6. Hurl Spore Sac (Ex) As a standard action a fungal bloater may generate and hurl a fleshy pustule filled with corrosive fluids and spores as a ranged touch attack at targets within 30 feet. A creature struck by a spore sac takes 8d6 points of acid damage and all adjacent creatures take 1 point of splash damage. Anyone damaged by the spore sac's corrosive fluids is exposed to cordyceps infection as if damaged by the fungal bloater's bite attack. A successful Reflex save (DC 10 + 1/2 fungal bloater's HD + fungal bloater's Con modifier) reduces this damage by half but does not negate the disease exposure. Cordycepts spore husk from The Last of Us. This hazardous fungus can be found in dark, wet areas, and often grows in great abundance at the heart of an infected lair. Formed from the corpses of cordycepts creatures, these tall stalks of fungal matter grow to enormous size if left unchecked, typically growing to a size equal to 5 feet times the hazard's CR. When a creature approaches within 5 feet of a cordycepts spore husk, the fungus releases a cloud of spores in a 10-foot radius burst in each 5 foot square the spore husk occupies. All creatures in the area are exposed to the cordycepts spores disease. The DC of the spores is equal to 10 + the CR of the hazard. The spores persist for 1 minute per CR of the hazard and can be dispersed by a strong wind. Spore husks take an additional 50% of damage from fire, and 5 points of fire damage is sufficient to destroy a 5 foot square of spore husk. Effect 1 Con damage, 1d3 Wisdom damage, and 1d3 Intelligence damage (this damage cannot be healed while the creature is infected); Cure 2 consecutive saves. Note Creatures reduced to 0 Wisdom or Intelligence by this disease are not rendered unconscious, but instead act as if affected by confusion until slain. Anyone who dies while infected rises as a fungal infected in 1d4 minutes. The sample fungal below infected use a human commoner as the base creature. Covered in sores and discolored lesions, this ragged looking man twitches and spasms in uncontrollable fits while clutching at his face, sobbing. Death Burst (Ex) When a fungal infected dies, it explodes in a burst of spores. All creatures adjacent to the fungal infected are exposed to the spores as if struck by a bite attack and must make a Fortitude save (DC 12) or contract cordyceps infection. Disease (Ex) The bite attack of a fungal infected carries the cordyceps infection disease. Spore Husk (Ex) A fungal infected reduced to 0 or fewer hit points, but not slain, falls dormant and no longer can naturally recover hit points. 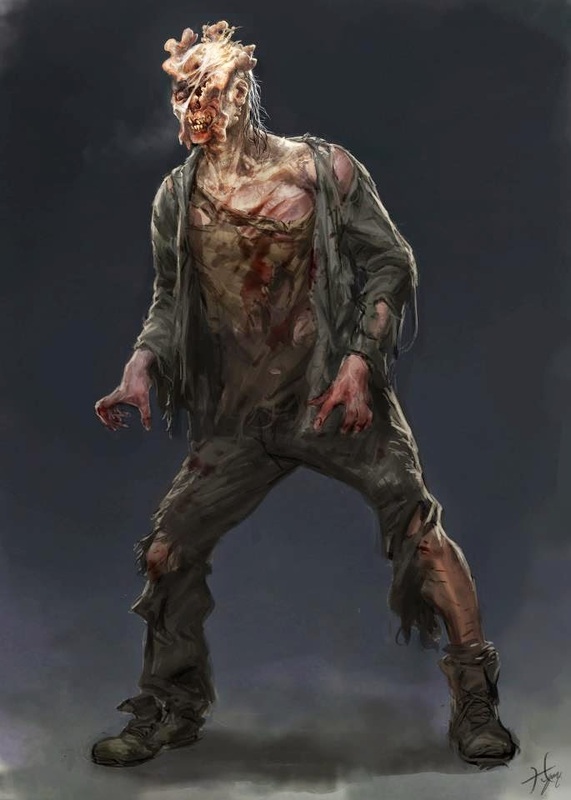 At this stage, the infected's body shuts down and is consumed by its fungal infestation, becoming a spore husk hazard (see above). A fungal infected's spore colony completes this transformation in 24 hours, growing into a spore husk that fills two 5-foot squares. Reddish orange fungal growths snake out of the empty eye sockets of this hunched figure. His skin is blotched with odd discolorations and veins appear blue-black. He croaks, intermittently, like a man who has lost his voice trying to cry out. Death Burst (Ex) When a fungal stalker dies, it explodes in a burst of spores. All creatures adjacent to the fungal stalker are exposed to the spores as if struck by a bite attack and must make a Fortitude save (DC 15) or contract cordyceps infection. Disease (Ex) The bite attack of a fungal stalker carries the cordyceps infection disease. Spore Husk (Ex) A fungal stalker reduced to 0 or fewer hit points, but not slain, falls dormant and no longer can naturally recover hit points. At this stage, the stalker's body shuts down and is consumed by its fungal infestation, becoming a spore husk hazard (see above). A fungal stalker's spore colony completes this transformation in 24 hours, growing into a spore husk that fills ten five-foot squares. 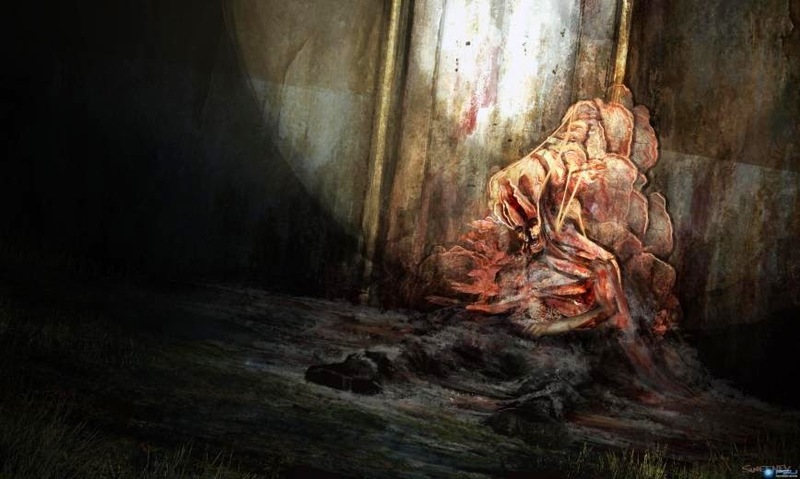 What was once a human face has become a flower-like blossom of split bone, drooling blood and reddish-orange fungus. Crooked, gnashing teeth in a split jaw lie below this floral display on a wiry body with powerful, corded muscles. Death Burst (Ex) When a fungal clicker dies, it explodes in a burst of spores. All creatures adjacent to the fungal clicker are exposed to the spores as if struck by a bite attack and must make a Fortitude save (DC 18) or contract cordyceps infection. Disease (Ex) The bite attack of a fungal clicker carries the cordyceps infection disease. Spore Husk (Ex) A fungal clicker reduced to 0 or fewer hit points, but not slain, falls dormant and no longer can naturally recover hit points. 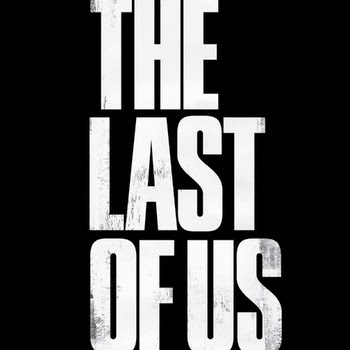 At this stage, the clicker's body shuts down and is consumed by its fungal infestation, becoming a spore husk hazard (see above). A fungal clicker's spore colony completes this transformation in 24 hours, growing into a spore husk that fills twenty-two 5-foot squares. This bloated, humanoid shape is barely recognizable a human. Covered in armored plates of hardened fungus over all its body, this creature moves with heavy-footed grace, while bulging sacs of yellowish-green fluid slosh between its armored carapace. Death Burst (Ex) When a fungal bloater dies, it explodes in a burst of spores. All creatures adjacent to the fungal bloater are exposed to the spores as if struck by a bite attack and must make a Fortitude save (DC 18) or contract cordyceps infection. 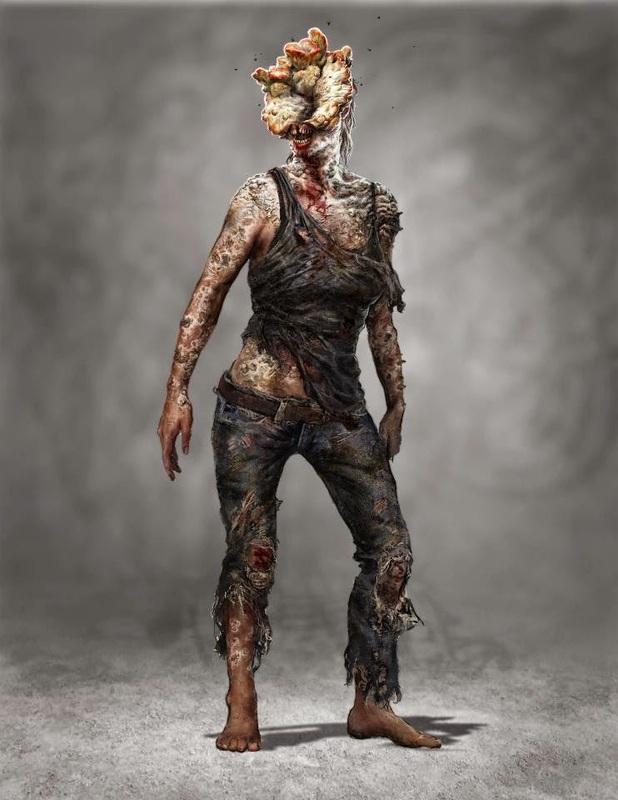 Disease (Ex) The bite attack of a fungal bloater carries the cordyceps infection disease. Hurl Spore Sac (Ex) As a standard action a fungal bloater may generate and hurl a fleshy pustule filled with corrosive fluids and spores as a ranged touch attack at targets within 30 feet. A creature struck by a spore sac takes 8d6 points of acid damage and all adjacent creatures take 1 point of splash damage. Anyone damaged by the spore sac's corrosive fluids is exposed to cordyceps infection as if damaged by the fungal bloater's bite attack. A successful Reflex save (DC 21) reduces this damage by half but does not negate the disease exposure. Spore Husk (Ex) A fungal bloater reduced to 0 or fewer hit points, but not slain, falls dormant and no longer can naturally recover hit points. 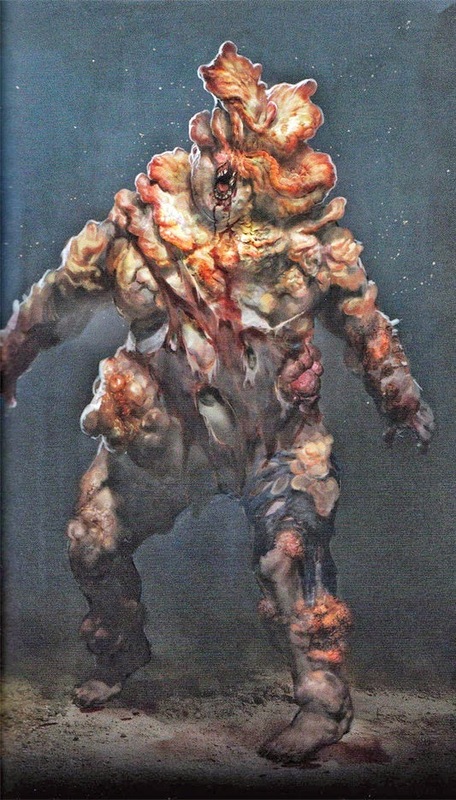 At this stage, the bloater's body shuts down and is consumed by its fungal infestation, becoming a spore husk hazard (see above). A fungal bloater's spore colony completes this transformation in 24 hours, growing into a spore husk that fills thirty 5-foot squares.